Our CSA boxes have been full of plump, ripe, amazing blueberries. Maybe it's years of conditioning but it seems somehow wasteful to simply eat the berries ($5 a box prices will do that to you). So instead I've been putting them in things. Muffins, pancakes, cobbler. And this past weekend, in a stroke of brilliance? Sauce. A syrupy, sweet, multipurpose topping/filling/syrup that will make you want to lick your plate. 1. This can be served warm or cold and is pretty much guaranteed to make everything more delicious. 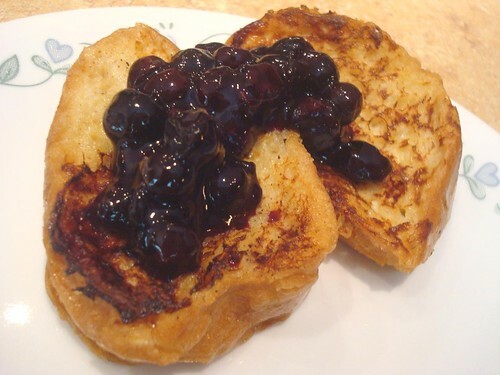 French toast (shown above), pancakes, waffles, cheesecake, ice cream. If you can put blueberry sauce on it, you probably should. 2. Leaving the berries whole lends a wonderfully thick and chunky texture to the sauce. If you preferred a more smooth consistency (say, for a blueberry version of this lemonade), just run it through a food processor after cooking.